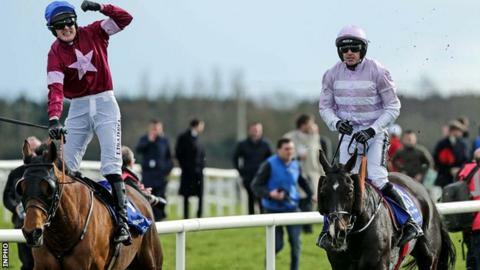 Rogue Angel produced a game front-running performance to win the Irish Grand National at Fairyhouse. The Mouse Morris-trained eight-year-old led from flag-fall in the hands of Ger Fox with Ruby Walsh travelling well on board Bless The Wings. Bless The Wings hit the front after jumping the final fence, but 16-1 shot Rogue Angel roared back tenaciously to win a thriller by a short head. Ballyadam Approach was third with Folsom Blue back in fourth. "I'm still pinching myself - I can't believe it. This is my local track and I'm just trying to take it all in, it's brilliant," said Fox. "I've only ridden him twice and he's given me a Kerry National and an Irish National. "What he has is guts and when he got headed, he battled back and got back up again. He never gives up." Morris, who rode Billycan to win the Irish National in 1977 and trained Hear The Echo to claim the prestigious prize in 2008, paid tribute to his late son Christopher, who died last summer from suspected carbon monoxide poisoning while travelling in South America. "It's unbelievable. Tiffer (Christopher) was looking down on me today. He helped me there. That's just special," said Morris. "I gave Ger no instructions. He knew the horse as he had rode him in Listowel and won a Kerry National on him, so there was no need for instructions." William Hill cut Rogue Angel to 33-1 from 66-1 for the Grand National at Aintree next month, with Ladbrokes halving him in price to 25-1.